Kayaking in Raja Ampat is without a doubt the best way to explore the archipelago. Gliding silently among these spectacular islands without the noise and fume of outboard engines is to experience nature at its wild and beautiful best in what has to be the world’s greatest sea kayaking destination. Kayak Misool with Millekul Adventures. Kayak the Dampier Strait region with Kayak4conservation. Raja Ampat’s maze of islets, peninsulas, bays and inlets provides kayaking opportunities for all skill and fitness levels. The calm, enclosed waters of Gam Bay are a safe environment for a first time paddle while affording plenty to explore. On the other hand, if you’re looking for a challenge, try working your way along Gam’s southern coast against the running tide! Unless you own a foldable kayak, bringing your own boat to Raja Ampat isn’t really practical. Great news for those wanting to go kayaking in Misool! Millekul Adventures have 16 sea kayaks based at Pulau Panun in the eastern Misool archipelago. Based on the island of Kri, Kayak4Conservation is part of the Papua Diving resort operation. For current prices, information and to make a booking, contact Millekul Adventures or Kayak4Conservation. West Australian Adrian Gawned contacted us after his November 2013 Raja Ampat kayaking trip – you can see his trip report and photos here at the Sea Kayak Club WA website. Frits Meyst has also posted some great Raja Ampat kayaking photos at his Adventure4ever’s Raja Ampat gallery. 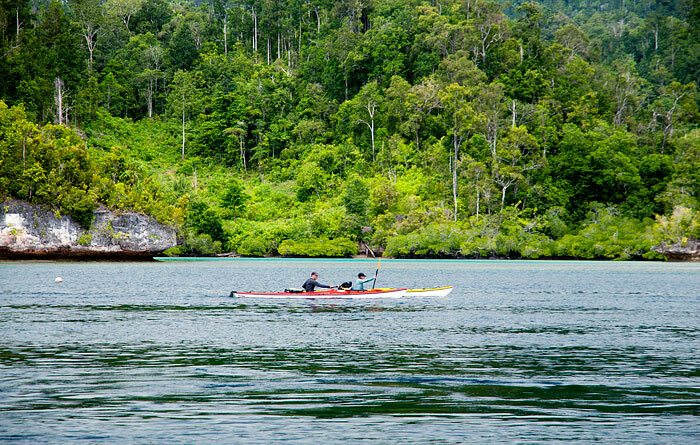 However you decide to go, seakayaking Raja Ampat will be an adventure you’ll never forget! Hi: I wrote on here in 2017 and finally coming to Raja Ampat. I’m solo, bringing an inflatable paddle board and will be staying in homestays. I only have about 10 days in the area and am just wondering if you could recommend for me your favourite places. My thoughts were Piaynemo, Gam , Rufus… And I’ve read that Misool was amazing…But just wondering about my time. I have nothing other to do but paddle, snorkel and hang in my hammock. I’d like to explore some trails and village life if available. Paddling…I’d like to see some variation in the water but also of the karst formations. Any recommendations would be so appreciated. Really looking forward to the adventure. You mean a SUP board Tami? We have no idea how far you can cover in a day on one of those, or what kind of conditions you need, but staying at Rufas and paddling across to Piaynemo, then heading back to a homestay near Gam Bay and checking out the bay itself and Kapisawar and Sawinggrai villages would hit all those points you’ve mentioned. I’m wondering whether there’s a “one day” tour kayaking in raja ampat? I’m planning to do kayaking for only one day, because time is too short, I take 3D2N trip for Wayag and Piaynemo. The rest of 2 days is no plan, I’ll planning to stay in Mansuar island, so instead of 3 days doing nothing in the island, I would love to try kayaking. Any recommendation for one day tour kayaking? besides of K4C, because I don’t see any option less than 8 days for kayaking. Or is there any homestay that provide kayaking in the homestay. Thanks and appreciate the answer! No one day kayaking tours that we know of. You can find homestays that have kayaks by applying the “Kayak (local use only)” Activity filter on the accommodation page. Been there, done that and want to go again! Best trip of my lifetime. hallo, can I ask about this? My boyfriend and I are planning a kayaking trip in Raja Ampat in April, where we’ll bring our own gear. Would love to hear about your experience, maybe schedule a call/Skype?! Yes i like to tel you about our expirience in raja ampat. I hope I can do it again in the future. Hi…I’m thinking of doing a s kayak/camping without guide in this area…Has there been any changes to renting kayaks since the last post? To the best of our knowledge the above information is still current. K4C doesn’t hire kayaks without guides. Want to do this ourselves… rent the Kayaks and stay at home stays…is it possible yet ? We are trying to rent 2 ocean kayaks in Raja Ampat for a solo trip, not a guided tour. At this moment K4C are not renting their kayaks for privately-run trips. Is there any other option? Sorry Gerard – like we said above, it’s either K4C or bring your own. I see you tried to rent kayaks on a non – guided trip. My husband and I are looking to do the same thing. We are avid kayaker and I have been in one too many guided trips in Indonesia. Please let me know if you found an outfitter. Hi, in case kayak4conservation is already booked out, can you advise of any other options to rent a kayak? Do any other homestays or resorts have kayaks that can be rented for multiple or single days? There’s nowhere else we’ve heard of that rents proper sea kayaks like K4C’s Kaskazis. Piaynemo Homestay has some available for guests, but as far as we know, they’re sit on tops and are not made for open water or available to hire out.